One of the many gems littered along the Icefields Parkway on the way to Jasper. The Athabasca River offers endless photo ops not far from the highway. If you’re prepared to brave the cold and maybe even get your feet wet you’ll be rewarded with some magnificent scenes. This is the shot that sparked my addiction to moonscapes. 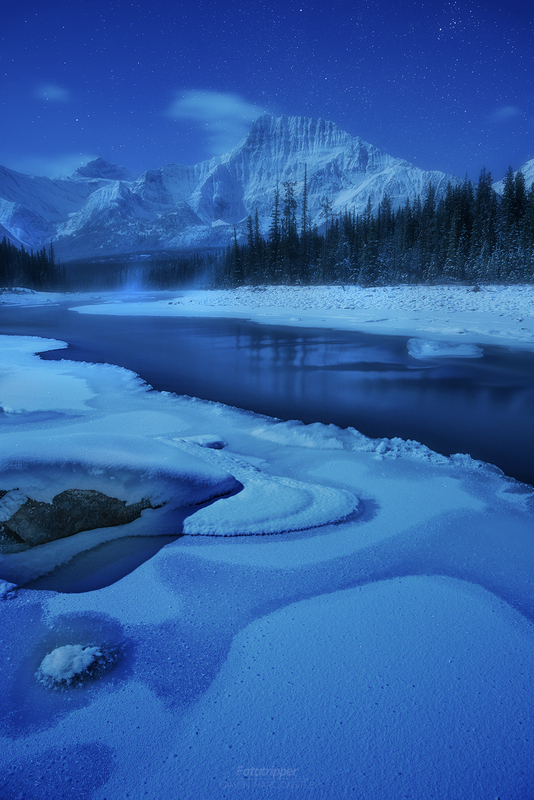 The full moon or half moon offers a special quality of light that works brilliantly in winter scenes like this.The soft, low moonlight bathes the icy landscape in this lovely blue glow that I find completely magical. You can see the moonlight sparkling in the hoar frost. This winter night was around -26 °C but I barely felt the cold as I braved the crumbling ice shelf at 2am. I was enraptured by the mist rising from the water in the distance and managed to keep my exposures down to 15″ even at f/8 because the moon was so bright.